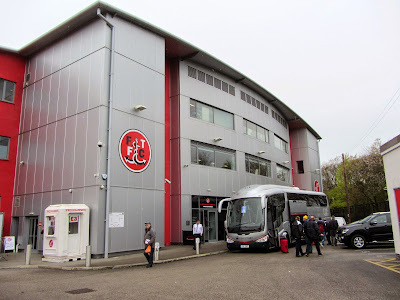 My ninth ground of 2015 was on Saturday 25th April at Highbury Stadium in Fleetwood, Lancashire. 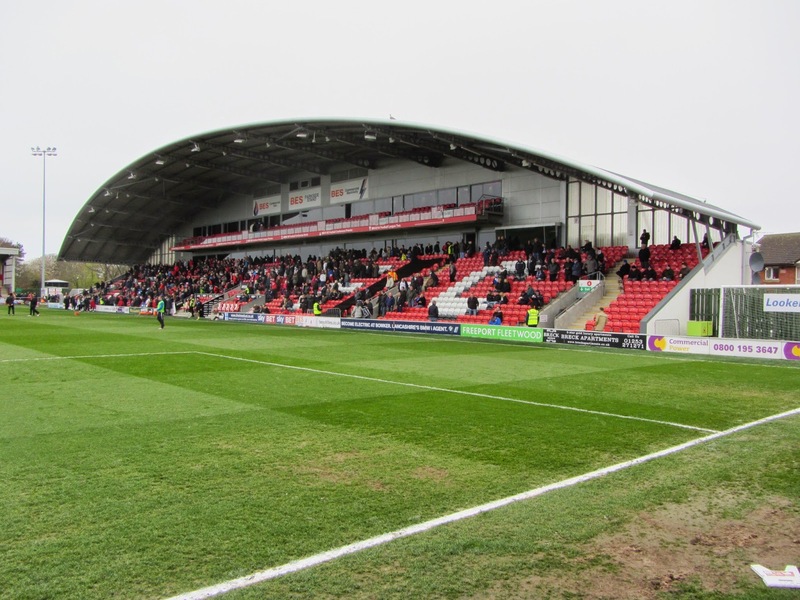 The match was Fleetwood Town vs. Colchester United in Football League One. Highbury Stadium is located one mile east of the Irish Sea on the Fylde peninsula. It is tightly hemmed in by housing on three sides and a park on the remaining side. Fleetwood does not have a railway station so the nearest station is Poulton-le-Fylde around six miles south. There are however connecting tram services from Blackpool which stop 200 yards from the ground. The venue has been home to the club and its previous incarnations since 1939. Having gone up six divisions in the space of a decade Fleetwood have had to adapt their Highbury home beyond all recognition. The latest addition is the Parkside Stand which dominates the ground. 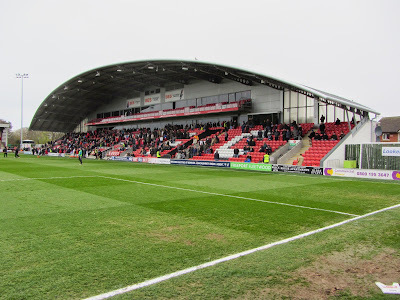 Finished in 2011 this stand has one main tier of seating with room for around 2,000 fans. At the back of the stand there are two levels of hospitality and conference areas with the top one of these including a balcony of additional seating which hangs over the top of the main seating area. The stand is topped off with a dramatic curved roof. It also contains the club reception and a small ticket office and club shop. The only other area of seating is on the opposite side of the pitch where the Highbury Stand is located. Due to the adjacent social club this stand only runs for around half the length of the pitch and has a total of 550 seats. The Memorial Stand sits behind the north goal and is a concrete terrace with room for just under 1,500 home fans. Attached to the back of the stand is an excellent bar known as Jim's Sports Bar which can be used by home or away supporters. 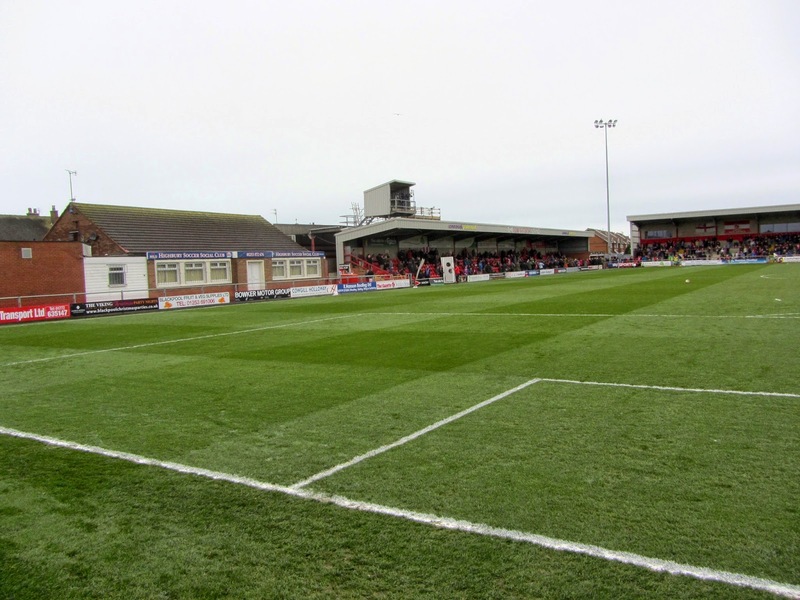 Behind the southern goal is the Percy Ronson Stand - this small terrace takes up around two-thirds of this side of the ground and has a capacity of just over 600. This is where the away fans view games from although there is also a small section of the Parkside Stand provided for those who want to sit. 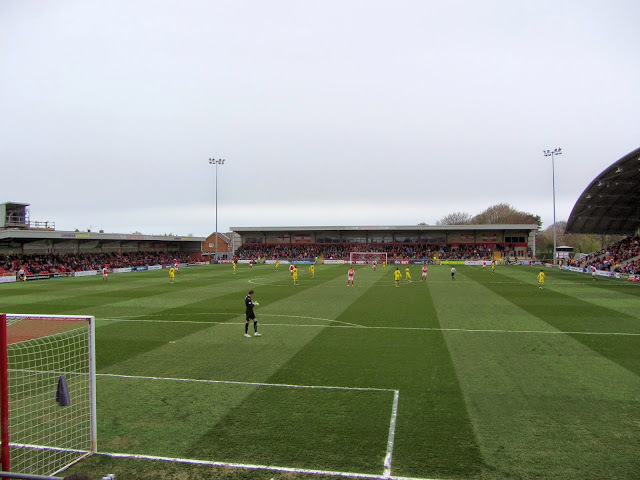 The first half was a pretty quiet affair - the closest moment to a goal was around the half-hour mark when Gavin Massey went close to scoring with a volley from six yards - on this occasion Fleetwood keeper Chris Maxwell was able to palm the ball away and smother Massey's rebound effort. The game sprung into life in the second half - barely a minute after the interval Colchester took the lead. Excellent work down the wing by Jacob Murphy saw him beat two defenders before crossing for George Moncur to slot home. The visitors went close to extending their lead on a couple of occasions but found themselves pegged back in the 64th minute when Jamie Proctor clipped the ball home after a chaotic bit of pinball in the Colchester penalty box. In the 73rd minute Fleetwood took the lead when Proctor's lofted pass found David Ball who shrugged off Bongani Khumalo before curling the ball into the corner of the net. This meant that the visitors were staring relegation in the face unless they could turn the game round and in an extraordinary end to the game they did. In the 84th minute Gaving Massey swung a ball into the box - Macauley Bonne failed to connect but his presence seemed to put off Maxwell in the home goal and he let the ball slip through his hands into the net. The U's went on the attack straight from the kick-off and only a minute later after the equaliser were awarded a penalty when Dion Sembie-Ferris was scythed down just inside the area. Chris Porter stepped up and slammed the ball home to complete a remarkable turnaround for the U's whose season had looked finished at one point. The goals which kept Colchester in the survival hunt proved crucial as the following weekend victory over Preston saw Colchester stay up.